Hidden away near the Transylvanian border of Muntenia is a royal secret loved by Romanian city dwellers as a quiet weekend escape. The first thing I noticed on this relatively small mountain was how deeply I began to breathe. The fresh, pine-scented, cool air from the Carpathian mountain ranges was like that first inhale of spearmint chewing gum on a bystander’s breath and a welcome treat after the heavy air of Romania’s capital, Bucharest. I refer to the Bastion as female because that’s the impression she gives me, stately and demure. The courtyard leads to twelve natural-themed double rooms, comfortably rated at three stars. Our room sat snuggled beside the gurgling, busy stream of Peles Brook Valley. In eras long gone you’d be sleeping in the royal stables. Now it’s comfortable rooms, a café that serves deliciously steaming lattes, and a linen-lined dining room with a life-like Napoleon painting gazing royally upon diners as they devour hot breakfasts of continental sausages, collapsing, herb-filled tomatoes, and eggs over easy. Above these stately abodes is a place you can let your hair down — Club Crazy Horse. (It was, after all, the stables!) Dance the night away to eighties pop or lounge in a comfy armchair between raising your cue in a game of pool. But the royal secret I promised you is the real drawing card here: possibly one of the best-preserved castles in all of Europe. Peles (pronounced pel-esh) Castle was built in the eighteenth century and is an extravagant blend of Italian Neo-Renaissance, Spanish, Elizabethan, Hungarian, Swiss, and Turkish influences and houses rare gilded-leather books, sculptures, intricately-woven tapestries beside stained-glass windows, and a fully-equipped armory. 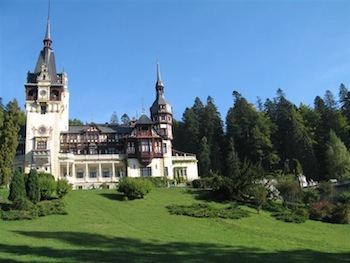 A quick glance to the right and you’ll find Pelisor, a smaller replica of Peles Castle, in all her splendor. Meander down towards the sparkling stream and you’ll come across small huts where market stall holders gather on weekends. It’s one of the best arts and craft markets Romania has on offer. Then, as you make your way over a small wooden bridge, perusing traditional Romanian clothing, sheepskins, and Romania’s signature pieces — handmade wooden musical instruments — you have two choices: you can continue around a cobblestone path, past a flower-covered monastery, and down the hill into Sinaia, or head back in the direction you came from, save the small town for tomorrow, and rest in time for dinner at the Cutitu d argint just down the mountain. Step back in time and prepare your senses for a knightly feast — eat your fill of an array of succulently-spiced lamb, juicy pork, and tender beef all served on a full-size sword! It’s a set price menu and a great way to sample local Romanian cuisine, all beside a roaring open fire. Beside Cutitu d argint is the Bastion Pension, a cheaper option for accommodation in Peles Brook Valley, still set in the Bastion complex and only a couple of minutes’ walk to all this mountain hideaway has on offer. Go to www.bastion.ro for current prices on everything the Bastion has to offer and make sure you check out opening times — they tend to change.